In the reception room you can enjoy a hot cup of tea or coffee, you can read or have a chat. A fridge will be at your disposal if you wish to store your drinks. The breakfast service is included in the room price. It is every morning from 7 to 10 am. Please ask our staff about an agreed airport transfer in Rome on arrival or on departure. Free unlimited Internet continuously for 24 hours. We organize multilingual guided tours to discover the secrets and the most characteristic places of Rome. The bed and breakfast is located in an elegant building from the early 900s. Situated in the Prati neighborhood between St. Peter’s and Castel Sant’Angelo. B&B Ondina consists of two cosy and fully furnished rooms. From here you can easily reach on foot the most central and characteristic places of the city. Each room is equipped with TV and Wi-Fi Connection.Breakfast is included in the price as well as bed linen and towels. A mini bar, free tea and coffee service are at your disposal throughout the day in the reception room.The owner speaks several languages and is ready to assist you with information or useful tips in order to make your stay more enjoyable. In the district, a few steps from the Basilica of S.Pietro and the Vatican Museums, you can find numerous restaurants, traditional taverns, bistros, bookstores, cinemas, cultural sites, and streets entirely dedicated to shopping. Crossing the Tiber and enjoying the unique landscapes, you can reach by foot in five minutes the Pantheon, Piazza Navona, the Spanish Steps and all the most famous monuments and museums of Rome. The neighborhood is well connected to the city center thanks a good public transportation and metro (A line). 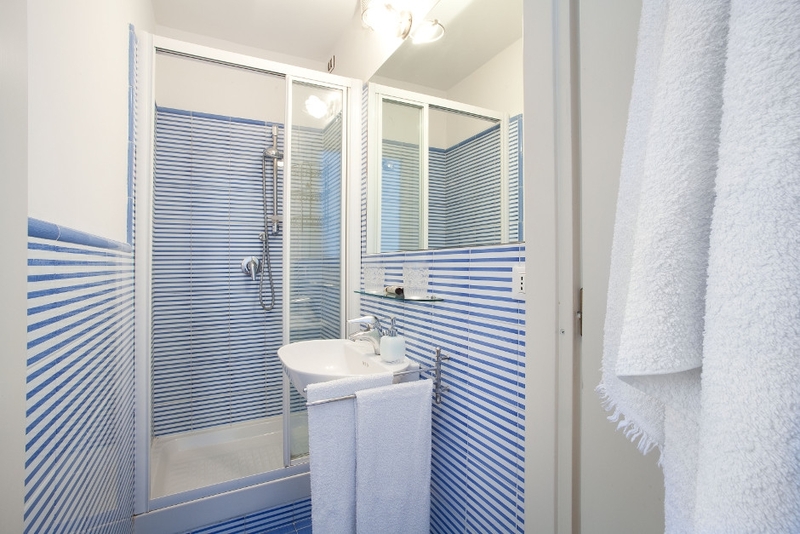 A double room equipped with large bathroom with bathtub and a vestibule. The atmosphere is warm and private thanks to a touch of red in the upholstery and furniture. 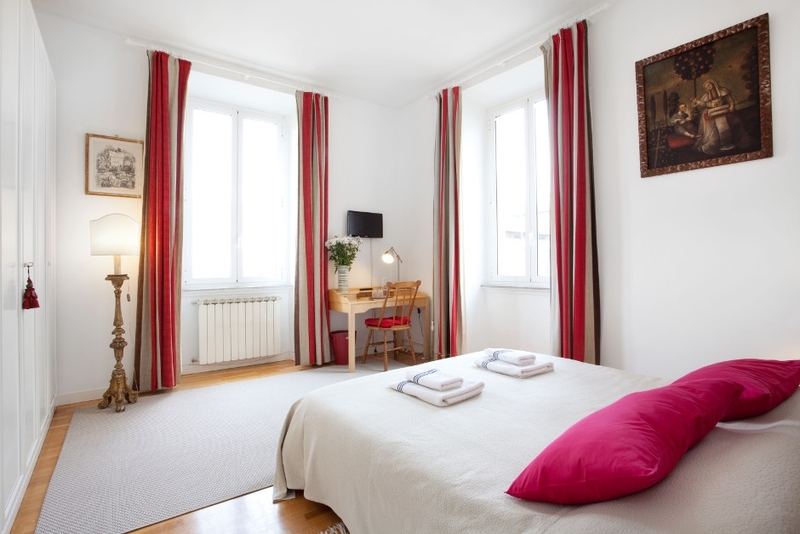 The room has a parquet flooring and two large double glazed windows that make the room very bright. 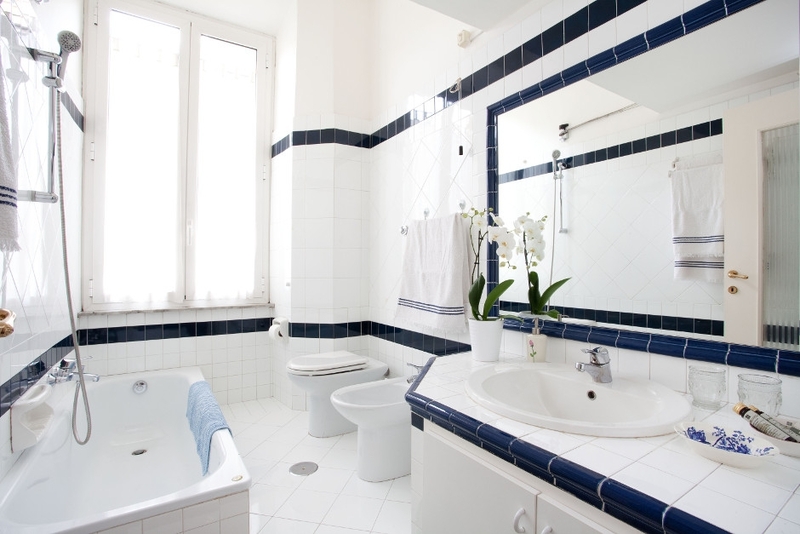 This room consists of a double bed (on request two individual beds), a washbasin and shower. The toilet is adjacent to the room, but it is private anyway. The room has a parquet flooring. The furnishings in white and the small details in sky-blue create a relaxing and welcoming atmosphere. Located in the centre of Rome – Staying in the city centre, only a few steps from the most important historical and artistic parts of the city. In the surroundings of the B&B you will find many great restaurants with very different kinds of cuisine from traditional roman to local, most modern and innovative cuisine. Not only buildings and monuments – The central and strategic location will allow you to reach not only the monuments and museums on foot, but also the most beautiful villas and parks in Rome. From Fiumicino Airport: Take the Sit shuttle bus (6 € per person) and get off at the first stop in Via Crescenzio 2, at the corner of Cavour square. The B&B is located only three minutes from the stop. From Ciampino Airport: Take the Acotral bus to the Anagnina underground station, from here continue with A line to Lepanto. Get off at Lepanto and walk to Via Tacito or take a bus to Termini Station; from here take bus no. 70, get off at Cavour square and reach Via Tacito. Single room or double single use from just €45, breakfast included. City Tax €3.50 per person per day. Spacious and refined double room from a minimum of €80 per night, breakfast included. City Tax €3.50 per person per day. Visit the photo-gallery to discover it!